Within the tourist quarter of sunny Beach, close to the long sandy beach, this spacious complex is ideal fora fun-packed, beach holiday. 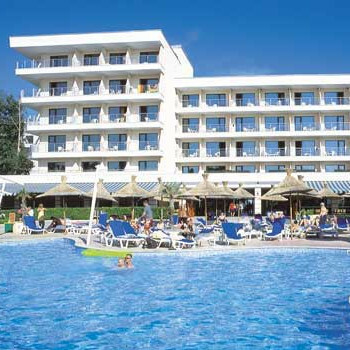 With a good range of facilities on offer, including a huge main swimming pool, this hotel particularly suits families. My partner and myself have just returned from a fantastic holiday at the Evrika. We arrived at the hotel at 04:30 in the morning, check in was very fast and they had even opened the restaurant for anyone that wanted food or drink. Hotel cleanliness was very hit and miss, our room was very clean, but certain parts of the hotel were not. The reception area tables did not seem to be wiped from morning until night, although there was a no smoking sign up people were still smoking inside, probably because it was raining. Also the public toilets in reception had a certain aroma about them (I do not think disinfectant is used in Bulgaria). The restaurant was quite an experience, always something missing i.e spoons, forks, plates, cups, glasses, teapots. Never went in once and able to get a table with a full set of cutlery and crockery (which you had to be quite careful about as a lot of it was chipped and cracked. My husbands cup leaked all over the table as we did not realise it had a crack right through it, not what you would expect from a 4* hotel! Also (German) children allowed to run riot around the centre serving isles, were people were carring soup etc., parents totally not bothered, even though other people complained to staff nothing was done about it - think because it was nearing the end of the season staff had switched off. The weather when we were here was terrible, and I know that it not anyones fault, but sun bed pads were left on sunbeds in all the rain, so when we did get a bit of a sunny day you could not lay on the !sunpads without getting a rather large wet patch on your bottom! Plenty of room to store sun pads, so why were they left on in the first place? Also a large problem with wasps, they are everytwhere outside, and tend to gather in large numbers around the soft drinks machines in the pool bar and the snack bar, not very nice when you get one floating in the drink you have just poured out. Also signs up everywhere politely asking people not to take food away from the snack bar, but people who think they do not have to abide by any rules were taking plates full of food and leaving them round the pool (too idle to take plates back) so therefore attracting more wasps and flys (Arghh) I found myself turning into grumpy old women as the week went on. Entertainment in the Rainy Bar was vert German orientated - German songs for them to sing along too - not that this was a bother but they do tend to take over. Would not go back to this hotel, infact would not go back to Bulgaria again (just did not feel comfortable in this resort). We were so impressed at the size and cleanliness of the hotel reception area,the friendliness of the staff, and the lovely bedroom. On our arrival at 1.30am we were told that the restaurant was open for us to have food and drinks. I cannot fault anything in the accomodation, we took a travel kettle to make an early morning drink. The food was varied and nicely cooked, lots of choice. The pools were very cold but lots of sunbeds. My grand daughter was poorly with a chest infection while we were there so had to visit the on site medical centre, the doctor there was excellent and as we had insurance with an excess waiver there was nothing to pay. The hotel is just across the promenade from a lovely sandy beach and the beach bar was open from 10-4.30. The entertainment seemed to be more for the Germans than English, but I suppose thats because they join in more than we do. food was great lots of choices. very clean, staff were always cleaning. the location was just right. staff were pleasant and very helpfull. not much on the entertainment kids would perhaps like it, done by the staff mostly. i would go to this hotel again. Hi, just got back from the Evrica it is a lovely hotel especially for families. We have just returned from our first holiday to Sunny Beach and would definetly return to Evrika. I have a 2 year old son and I felt that the hotel was great for children and we felt very safe. It is just a few steps from the beach and the pool is fantastic. We always managed to get sunloungers/parasols which are included on the all inclusive option. The Hotel was very clean and the rooms were spacious. We had a twin room but there was plenty of room for a double sofa bed (which my son slept in) and for a cot. Room were cleaned and towels replaced every morning and bedding changed twice a week. Only insects we saw were a few ants on our balcony. I really enjoyed the food and didnt find it too repetative, although I personally would have prefered some of the meet cooked more. Breakfast there is bacon, eggs, toast, cereal, fruit, croisants, yoghurt, plus cheese and ham for the German guests. There is a snack restaurant by the pool which is a little repetative with chips, pizza, hot dogs etc everyday... plus lots of ice cream and fruit. Main meals changed each evening but you choose from potatoes, chips or rice each night. Also has a kids section. Desert was always fruit or ice cream with lovely little cakes. You choose from two sitting times when you arrive and then you always have the same table number. the first time is 6pm (but you can arrive anytime up to about 7pm) and the second was 8.30pm. We went with the first sitting as did most families with children. I expect the later times was better for couples with less kids! The only negative thing about the main restaurant is that it doesnt have much atmosphere, with no music etc. There were two feature nights (Greek and spanish nights for our stay) but its just the menu, no music or anything. Gave us an excuse to try local restaurants though! Bar staff were good and spirits are in very strong measures. I would have prefered fruit juice but if you ask for vodka and orange, you get orange squash.. Wine was actually quite nice though and husband is still talking about the beer! The entertainment team are quite good, but due to having young child we didnt get very involved. There is water aerobics, games, beach volley ball and the usual during the day, and shows in the evenings. They try to cover as much in english, german and bulgarian as they can. Great for kids with play areas, nursery, area for them to paint pottery and kids clubs. My son loved the clown who did the kiddies disco each evening at 7.30am outside. There is a 24 hour doctor on site which my mum used and found very helpful. We found this hotel to be of a very high standard. Rooms cleaned every day, if you were still in room would come back at a later time, she would even fold the kids sleep blankets. Staff constantly cleaning the hotel. Food was excellent sometimes a bit repetitive but there was a wide choice available so you would not necessarily need to pick the same things all the time. There was always something different for the children to eat but they did provide the usual pizza, sausages etc everyday just in case. The location was ideal right on the beach and within walking distance of the centre of the resort. Couple of bars near to the hotel but our family room was not near to them. Hotel staff very friendly and always spoke. Bar staff friendly but sometimes a bit slow. We did have a problem with one noisey neighbour but we contacted reception and they arranged for security to deal with straight away and it was. Entertainment generally started from 10am, kids club 10 -12 and 3 - 5 but mostly used by the German children. Adult activities also started at 10am variety of games throughout the day. The Animation team were very friendly and tried to get everyone involved. Rarely saw the evening entertainment so would not like to comment. Definetly would like to visit again soon! Me and my hubby and my friends and there daughters have just returned from the Riu Evrika and found the hotel to be brilliant in every way. Our room was cleaned every day and the maid worked around us and that was good because normally if you are still in bed they miss you and come back the next day but she did our room every day no matter what. The food was very good but got a bit the same after 2 weeks but the choice was excellent and you could eat from about 8am till 9 at night. There is also a snack bar during the day if you feel a bit peckish. The hotel is on the sea front and you do not have to pay for the sun beds or umberellas so thats good as it can get expensive. There is also a beach bar that is part of the all inclusive as well you can only get soft drinks and beer though from this. The pool at the rear of the hotel is huge and very nice there is also a sun terrace for the serious sun worshippers ha ha that would be me lol. There was entertainment in the hotel but to be honest we did not bother with it so I cant really comment. I loved this hotel but i am sorry to say I was not that impressed with sunny beach itself it was to much like a spanish resort for me. I almost forgot you get towels every day for round the pool and can change them in a morning and at night if you wish this is also included in the AI. Hope anyone going to this hotel will enjoy there stay as there is no reason why they should not.